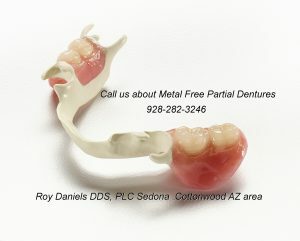 Looking for a Metal Free Partial Dentures? The main reason you may be interested in a metal free partial dentures is for esthetics, but you may have a concern about metal sensitivity. A partial denture replaces one or more missing teeth and most people find that a partial denture is better than a full denture. What does a metal free partial denture cost? The cost of a metal free partial denture is almost the same as a metal removable partial denture.